The Official Guide To: "2 For Flinching"
1) If you flinch when another person fakes a punch toward you, and does not make contact with your body, the person who threw the fake punch gets 2 free, unguarded punches to you. 2) A flinch does NOT include a blink, change in facial expression, or a yell. 3) The punches will be applied to the flincher's arm, between the elbow and shoulder, unless otherwise agreed upon by both the flincher and the puncher. 4) There is no limit to the amount of punches that may be applied in any one day. 5) In the event of a dispute about a "flinch", a witness not involved in the punch or flinch may be consulted. 6) The final say in any dispute goes to the puncher and flincher. If a dispute cannot be settled, there will be no punches. In other words, the tie goes to the flincher. 1) Revisions to basic rules, and changes made to suit special circumstances, can be made at any time. 2) The changes will not occur until the next day. 3) The rule in section 1.6 is always the same. Amendment I- The Wipe- An optional and additional rule that can be placed in effect. After the 2 punches have been given, the puncher must wipe the flincher's arm (or other place of punch) within 5 seconds of the 2nd punch. In the event of a failure to wipe, the original flincher is awarded 1 punch to the original puncher. The new puncher still MUST wipe, or the cycle repeats. Amendment II- Twins Amendment- This amendment was made specifically for the men, but can have meaning for women as well. The crotch is NOT off limits for 2 For Flinching, however, a SLIGHT movement backwards by the male does NOT count as a flinch. This is because that is a natural and overall important reaction to have. A jump out of the way IS still a flinch, and the 2 punches are still fair to take. Amendment III- Rapid Fire Amendment- Sometimes, multiple real punches may be used before the fake one in order to draw the flinch. However, if more than 2 punches are done in rapid succession (less than 10 seconds apart), the puncher must wait 30 seconds from the last real punch before trying to draw a flinch. Amendment IV- The Fakeout- Once a person has flinched and the puncher is lining up to punch him, some people will pull an illegal move called the fakeout. This occurs when the puncher takes his first hit, and then fakes the second to draw a flinch. This move is off limits. 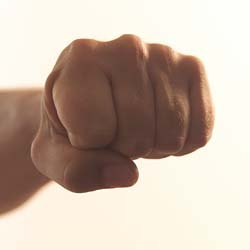 Unless the person commits a HUGE flinch (agreed upon by both parties or a witness), the puncher is not awarded any extra punches. Amendment V- Transfer Amendment- Punches earned are NOT transferable. The person who drew the original flinch is the person responsible for taking, or dismissing the punches earned. Amendment VI- Law of Accumulation- The puncher may accumulate as many punches as possible, as long as he follows the rule in Amendment VII. Amendment VIII- Payback- If any rule or amendment is broken and punches are received by the "flincher", the "flincher" is awarded the equal amount of punches back on the original puncher. The "flincher" must be able to prove his point though. Amendment IX- Fair Play- In order to participate in 2 For Flinching, everyone involved must be aware of it. It is ILLEGAL for a willing participant to threaten retaliation for any legally earned punches. This is one of the most commonly broken rules, and is very important to abide by. In other words, if you want to punch someone for flinching, you must be able to take punches back. * Amendments are just suggestions, but are strongly recommended to make the game more fun, and fair.